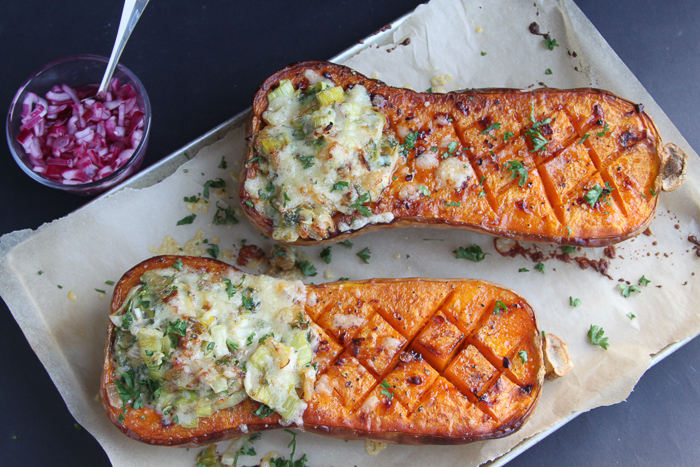 This has to be a contender for the ultimate comfort food – sweet, roasted, caramelised butternut with a hint of chilli filled with melty leeks, strong tangy cheddar and a final flourish of fresh, verdant parsley. The molten, almost fondue like, cheese combines so well with the squash; cosy, heart and soul warming food – a veritable hug on a cold and rainy day. These are all ingredients I keep to hand at this time of year and if I wasn’t going to go the above route (although why I wouldn’t, I can’t think…) I have another idea for you. Roast chunks of butternut in the oven, meanwhile soften leeks in a large pan with a splash of oil and a knob of butter. 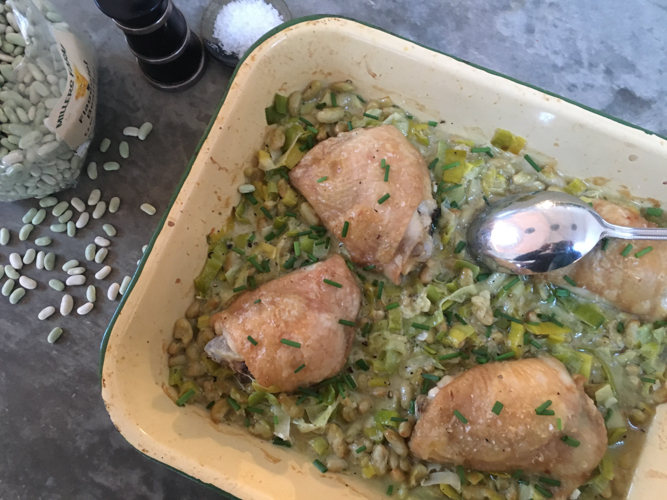 When the butternut is soft add to the leeks with a litre of vegetable or chicken stock, a splash of dry sherry and a pinch of chilli flakes. Whizz with a hand held blender and serve with a swirl of cream and a slice or two of cheese on toast. Two choices, which way to go…..
Preheat the oven to 200. Cut the butternut in half, scoop out the seeds and then brush the cut surface with a little olive oil. Sprinkle with a pinch of chilli flakes, salt and pepper and roast for an hour or until soft and caramelised. Meanwhile melt the remaining oil and the butter in a pan and cook the onion and leek gently until soft. Add the grated cheese, cream, parsley and season to taste. When the butternut is done remove from the oven, divide the leek mixture between the two halves, sprinkle with a little extra cheddar if you want and then return to the oven for 5-10 minutes until golden brown on top and bubbling. This would serve two for lunch with some quick pickled onions (August 2014) and a salad or four as a side if you halved each half. Barbers very kindly gave me some of their Vintage Reserve Cheddar and this is what I used for this recipe.